With the Playoffs approaching, the fate of many fantasy teams is riding on this week. If you are one of those, you are in luck, because we are here to help. Now let’s start by checking out what Vegas projects for the Washington Redskins in their road-matchup against the Arizona Cardinals in Week 13. The Redskins are mere one-point underdogs, and at 24 points, have the ninth highest implied total of any team this week. They have scored more than 24 points in seven of 11 games so far this season, including each of their past five games. Meanwhile, the Cardinals have only allowed more 24 or more points in four games this season. On the bright side, three of those have come in their past four games. That all bodes well for Washington’s chances of scoring at least three touchdowns this week, which in turn means they are a good target in fantasy football. 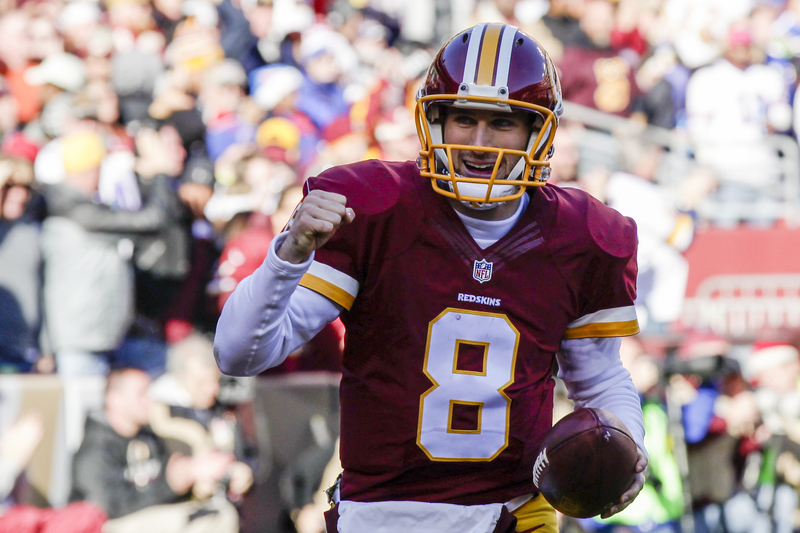 Now let’s narrow it down to which of the Redskins players should be in your daily fantasy lineups in Week 13. Cousins has racked up 18 or more fantasy points in nine of 11 games this season, which seems like it would make him fairly safe to use in any contest. But Arizona has already held four opposing quarterbacks to single-digit fantasy points this season. And with Cousins priced near guys like Russell Wilson on both daily fantasy sites, it’s best to avoid him in cash games this week. However, Arizona has allowed 19 or more fantasy points to two of the past three quarterbacks they have faced, and Cousins is averaging 28.68 fantasy points over his past two contests. That combined with the likelihood that he will be underowned due to the other guys priced around him, puts him in consideration for tournaments this week. The Cardinals have held every opposing quarterback under 24 fantasy points this season, so it’s not likely that Cousins keeps up with his recent average. But the low ownership, and the ability to spend up elsewhere in your lineup does keep him in consideration. Pro Football Focus projects that DeSean Jackson will draw shadow coverage from Arizona’s best cornerback, Patrick Peterson, which means the rest of the wide receivers should see a lot of Arizona’s other cornerbacks. The weakest spot in the Cardinals secondary lies in defending slot receivers. According to Scott Barrett’s DFB Matrix, 45% of the fantasy points that Arizona has allowed to opposing wide receivers this season have come from the slot. That bodes well for Jamison Crowder, who has run 73% of his routes from the slot this season. He has been on fire recently, with at least 80 receiving yards or a touchdown in each of his past six games. His price has risen, but he still costs just 12% or less on each of the daily sites, which keeps him as a great play in all formats this week. With Peterson following Jackson around, Pierre Garcon will likely see a lot of Marcus Cooper, who Pro Football Focus grades as the 108th best cornerback in the NFL this season. That’s 108 out of 120, which is terrible. Because Garcon has only topped 75 yards three times this season, and found the endzone twice, he cannot be trusted in cash games. However, at his low price, with an excellent matchup, he is worth a flier in tournaments. He is especially worth a look on DraftKings, where he has racked up double-digit fantasy points in seven games this season. After rebounding from a shoulder injury against the Dallas Cowboys on Thanksgiving to rack up 95 yards and two touchdowns (and in turn showing us all that he is a bigger man than us), Jordan Reed has not practiced this week, and is unlikely to play on Sunday. That leaves Vernon Davis as the starting tight end, which would normally make him an excellent value play. However, no team in the NFL this season has held tight ends to fewer fantasy points per game than the Cardinals. So, as much as we want to hunt value, it’s best to leave Davis out of your lineups in Week 13. The Cardinals are allowing the second fewest fantasy points per game to opposing running backs this season, which takes Rob Kelley out of consideration in this one. Yes, he is still fairly cheap on both sites, but you will be better off looking at safer guys priced around him this week like Jeremy Hill. As I mentioned earlier, DeSean Jackson is likely to be shadowed by Patrick Peterson, which takes him out of consideration in any format. Pro Football Focus grades Peterson as the NFL’s 14th best cornerback this season, and he is allowing just 0.20 fantasy points per route to opposing receivers. I’m also not going to rule out that he hasn’t been drunk all week celebrating his 30th birthday. Just kidding (but not really).